Our past isn’t the only one. Most of the virtual worlds that exist through video games have histories of their own. Some are long and detailed and only individuals truly dedicated to the lore can possibly know the entire history of their world today, be it Azeroth, Ferelden, or Norrath. Despite the fact that this lore is created by people and not a record of actual events, one recent episode reminded us though that history, even of a virtual world, is a work of memory. A player at the last Blizzcon stood up and corrected one of the developers about a character’s lore. 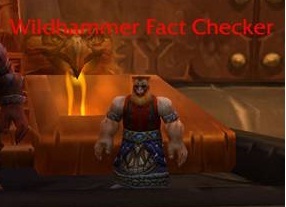 The player was right, the developer was corrected, and the player went down in fame as the Red-Shirt Guy and has a non-player character representation of himself now officially stationed in Ironforge. Even the very creator of history failed to remember how things had actually happened. History as memory. For some reason, kids in school today think of history as a list of facts, most of them composed of dates. In 1492, Columbus sailed the ocean blue. History is actually a lot more complicated than that as my Ancient History students come to learn. Last time, I spoke about how Civilization V can help us think about our own views of history and perhaps challenge them (and those of our students). Games can help us see that history is actually a work of memory and narrative, even a game as mainstream as World of Warcraft. In December, Blizzard released the latest expansion for World of Warcraft in which a dragon named Deathwing comes to the land of Azeroth and shakes its foundations. The world is completely changed – there are chasms where there were mountains before, lava where there was grass, grass where there was lava, and also just changes that have happened over the five years we’ve been inhabiting the land. Azshara has been taken by the Horde and hosts the Vegas-style pleasure center of the Goblin billionaire. Westfall has seen a massive build-up of Stromwind troops and although Van Cleef is dead, his daughter is now lurking about and pulling the strings. Hillsbrad Foothills has been ransacked by the Forsaken and completely unsafe for anyone of the Alliance. For the players, these changes happened overnight. Literally. One night it was Azeroth of the past, then the next morning it was Azeroth of the present. The player never actually saw the changes while they were taking place. He only sees the result. So what actually happened the day Deathwing came while the player was comfortably asleep in his bed (or nervously drinking Red Bulls in anticipation)? Blizzard tells the history of that day through their quest storytelling. In much of Azeroth, a player is taken through the story of the aftermath quest-by-quest and they watch the landscape around them change to reflect their progress through the story. But these quests still start after the day Deathwing came, “D-Day” if you will. What happened on that day? The only way to find out is to listen to characters who were there and hear their memory of the events. One particularly quest in the Badlands is entitled “The Day Deathwing Came” and gives the player three different memories of that day. The quest allows the player to somewhat enter the memory of each character and see Deathwing as he attacks the Badlands. Each character has a different story to tell. One speaks of how he chased him across the zone to go punch him in the face. One claims to have beaten Deathwing in a knife fight. One remembers shrinking the world so he could reach the sun and grab the dragon. All of their tales are fantastical, but they are how they remember D-Day, or maybe, how they want to remember D-Day and how they want you to as well. As the historians we can find in our libraries, these characters tell history through their own lens. Other quests in the game now will show flashbacks to the world before Deathwing or have text that talks about the trauma that resulted from his attack, but none of them make such a formal attempt to impress upon the player the events of that day. No players finish this quest believing the stories they have just heard, but they are still greatly impacted by the way Deathwing and the characters are portrayed. Through this fantastical telling of one historical day, the players and the characters are both empowered and the villain is reduced to something manageable. In these histories, D-Day becomes not a moment of terror and helplessness, but an opportunity for action and heroism. Which was it? 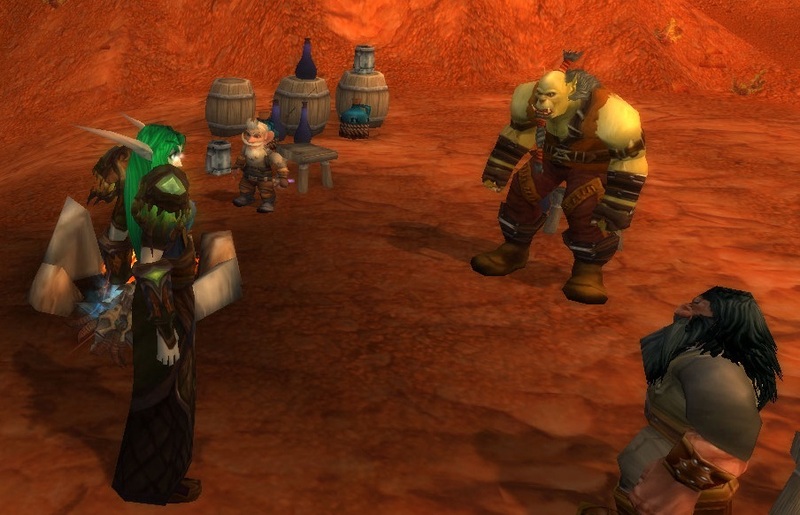 Were these three characters really so brave as they say or were they shaking in their boots like the rest of Azeroth? We will never know. Never. The past is lost to us except in the narratives told by those who were there – not only Azeroth’s past is lost, but our own as well. Every history we read has been filtered through someone’s memory, has been interpreted and adjusted for context. Students either forget or don’t realize that it’s more complicated to tell the past than just to say what happened. This quest gives us a lovely exercise in looking at bias and the tendency of narrative to go beyond facts and tell history as a story. Emily, great insight at the end — I’d hedge my bets on students simply not realizing, rather than forgetting. We do such a disservice to exploring the past in school because students (almost exclusively) are told about history, rather than experiencing history. So how do we transfer the learning about historical bias/narration (like what is happening with that particular quest in WoW) into the learning experience of the students? That comparison between telling and experiencing is especially relevant to that quest because the player actually enters into the characters’ memories and plays through them. You punch Deathwing in the face, for example. History is often, I think, prefigured in students’ minds as something distant and irrelevant. We have to be able to bring it to life like this quest does while also challenging their tendency to believe what they hear. Sticking with the game as a tool, having students try to find out what actually happened on this D-Day could be a fun and helpful task. They’d have to look up video and screenshots of the world before and after, read through quest text, either watch this quest on Youtube or do it themselves, etc. Actually trying to do history could really help them see that things are much more nuanced than dates make them appear. Currently, the #jan25, #egypt feed on Twitter is a great way to see how people interpret events through their own perspectives. Just having them watch Obama’s speech, write an impression, and then look at all the tweets about it could be an insightful exercise. It would also bring the lesson back to the real world and to history as it happens. Here’s a question: why is the event so memorable for the players? Is it because they were just merely told about the npc who claimed to punch Deathwing in the face? Or because they were shown a cut scene of the NPC punching Deathwing in the face? I’d argue it is so memorable because the player is actually involved in the narrative of that moment, experiencing the event as if s/he was there. If the learning objective was to understand the impact of the day Deathwing appeared, I’m not so sure the act of digging through videos or screenshots would have a significant impact; after all, the students would just be told what happened, rather than experience it. The quests as you outlined in the main article allow the player to actually experience the coming of Deathwing in a way no Youtube, screenshot, or FAQ walkthrough can possibly achieve. I think it depends on the lesson you’re trying to teach. If you want to make history memorable, this isn’t the best analogy. Sure, we can send students into a simulation of a historical event, but that event is going to be a representation created through someone else’s perspective and with their bias. It might be useful to show variations of the same event (as this quest does) to show bias, but it’s likely also rather impractical for teaching them everything they should know. Making them go through and try to dig through bias and perspective to find out what really happened would teach a different lesson entirely. Since they’ve already seen that history is told through the lenses of its narrators, now they go on a search for what really happened. Is it possible to even know? As to your last point that this assignment of searching for history is just another way to be told history, I’m not sure that the quest isn’t being told history either. Yes, they experience the telling, but not the event without any bias. They experience someone else’s memory. They’re not actually transported to the event to have a personal experience themselves, unblemished by interpretation. The point is that such an experience is forever lost and even the most interactive (hi)storyteller can’t ever give it to you. He can only give you his version. I think one of the interesting things about the Deathwing example is that it shows a phenomenon that normally takes a generation growing old and dying. Once we get to the point that very few eyewitnesses remain, individuals can step in and try to reframe history the way that they see (or imagine) it. This is the kind of thing Birth of a Nation did in relation to the Civil War and Schindler’s List did for World War II. In this case, the history of Deathwing becomes the story of one man’s quest to punch him in the face. Another interesting thing, as you mentioned, is the fact that the player has the unique position of being an eyewitness both before and after the event, but not an eyewitness of the event itself. It places the player not so much in the role of the historian, but in the role of the historiographer. you’re in point of fact a good webmaster. The web site loading pace is incredible. It kind of feels that you are doing any distinctive trick. Furthermore, The contents are masterpiece. you have performed a fantastic task on this matter!